With the race well in hand, Doorow came down the steep hill after the pain cave, and as many have done over the years had a difficult time navigating the sharp left hand turn that was very slick. The spill might have cost him a few seconds as he had to regather to sprint to the finish. "My goal was the break 16 minutes, it didn't make it." Doorow said of his game plan coming into the race. Paul Casavant of Hampden Academy was the runner-up, the junior has finished behind Doorow in three straight races now, but today he was the closest he's been all year as he clocked a 16:31.26. Casavant will be the favorite coming into the 2016 as the top individual returner. Gorham's Jesse Southard had a strong race as he was able to hold onto third place with a 16:43.19, he was the top runner from Southern Maine. Southern Maine Regional champion Colin Tardiff of Scarborough finished 4th in 16:45.09, while Cameron Meier of Mt Ararat continued his strong post season surge to finish 5th. In the team race, Scarborough behind 3 in the top 8 won their second consecutive team title, and the 8th in the last 12 years for coach Jim Harmon. The Red Storm were paced by Tardiff in 4th, but got strong races from seniors Connor Doherty (6th) & Andrew Sholl (8th) as they tallied 60 points to win by 20 over Falmouth. 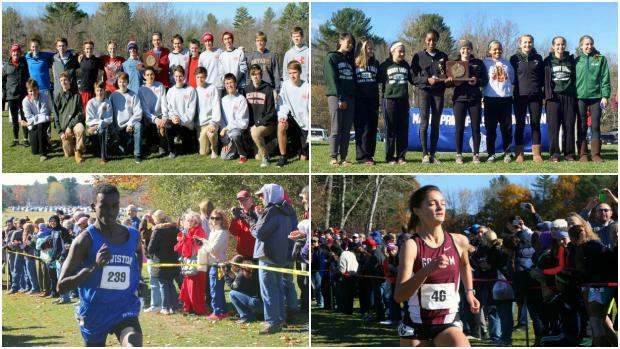 Falmouth was paced by senior Sean Soucy's 11th place finish, and had all 5 scoring runner in the top 27, the best for any team. Hampden Academy was third with 141, they will be the early team favorite for 2016.